Community Groups (CGs) are places to cultivate both a relationship with God and friendships with others within the Redeemer LSQ family. It is in these small communities that men and women can build personal relationships and practice applying the gospel to their lives. Each group expects to experience Jesus Christ in its midst, enabling participants to be transformed through mutual ministry and to experience life in the family of God. These groups provide sanctuary from the pressures and anxieties of life in the city and facilitate the formation of new friendships. Community Groups are places where we can be revitalized and strengthened as we seek to reflect the love of Jesus Christ to our fellow New Yorkers. As God made us for community, we need others to help apply the gospel to our lives. Our hope is that everyone who attends Redeemer Lincoln Square will be involved in a Community Group. Generally composed of 6 to 12 people, groups meet in homes and offices throughout New York City. All groups are led by trained volunteer leaders from our congregation who receive oversight and support from our pastoral staff. Groups generally meet two to four times a month for worship, Bible study, fellowship and prayer. Ideally, most groups participate in monthly service projects or social events in place of a regular meeting. We have many groups that you are welcome to join at any time of the year. Click on the image below to find a Lincoln Square community group near you. You can use the filters to select a group that meets at a time/location that would be easy for you to attend regularly. Email [email protected] for further assistance. If you're interested in leading your own Community Group, or you want to open your home as a host for a Community Group, please reach out to Chuck, one of our Assistant Pastors, at [email protected]. He will help you navigate the next steps! Mondays at 9:30 a.m. at W. 83rd St.
Mondays at 10 a.m. at W. 99th St.
Thursdays at 9 a.m. at W. 83rd St.
West Side Women consists of two groups holding weekly gatherings at W83 Ministry Center. These meetings are open to all women from Redeemer and their friends for worship, prayer and Bible study to better know and experience God in community. The Tuesday group meets at 7:15 p.m., and the Friday group meets at 9:45 a.m. For more information, register here or contact Marion Melton about the Tuesday evening group, or Karen Wentling about the Friday morning group. All men are welcome to join us on Tuesday mornings at 7 a.m. each week at the W83 Ministry Center for coffee, bagels, fellowship and prayer. Our meetings are informal, and no preparation is required. Registration is encouraged, but feel free to come by. For more information contact Drew Melton at [email protected]. Community Groups (CGs) are ongoing groups that welcome newcomers year-round. They are meant to be smaller communities than a normal Sunday morning service, and thus, provide a warm space to get to know new and old friends alike, and to be known for and cared for by the Redeemer LSQ pastoral staff. There are several group choices. How should I go about picking one? Start by choosing your congregation. 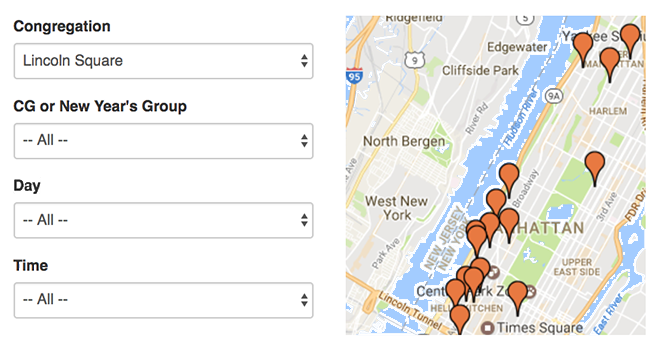 At the top of the map, filter by location, time and type of group. Regular group attendance is important and beneficial for community, so try to find a group that is convenient for you. If you need further guidance, contact [email protected]. Please contact our Pastoral Resident, Chuck, by emailing [email protected]. While our leaders do their best to contact you in a timely manner, things happen. If you have not heard back after a week, we will be happy to help contact the leader for you. Am I allowed to join a group that is affiliated with a different congregation than mine? While you are free to join any CG that is convenient for you, we highly recommend joining a CG that is affiliated with your congregation. Instead of seeing the members of your group just once a week at CG, you will see them again at church, making a large church feel smaller. What does the “Affiliate church” option on the find a group map mean? This will filter for groups that are not sponsored by Redeemer Presbyterian Church. These groups are led and hosted by members associated with one of our affiliate churches, and they welcome Redeemer attenders in their area to attend. "Community groups are places of warmth and support, where new friendships are created and old friendships are deepened, where we are known for and cared for, and where we can seek the flourishing of this great city."